The S&P 500 Index is a good representation for the broader US stock market. It is down about 15.5% from its high in late September and about 7.5% from the beginning of the year. In this Letter, I put things in perspective and share my thoughts on why it happened and where we are headed. Long-term price charts almost always tell a story and historical prices are as real as anything in the financial world where crowd noise and emotion often cloud facts. The logarithmic scale is different than the regular linear price chart you will first see when you pull up a stock ticker on a financial website. It shows the percent change instead of simply the price change. It does a better job at showing the return impact of a trend over a longer time period. I annotated the above chart with (1) a lower bound trend line that generally goes from the bottom in the early 1980s through the early 2009 global financial crisis low and on upward and (2) an upper bound trend line that generally shows the upper limit except for the internet bubble of the late 1990s when stocks became exceptionally overvalued. In other words, these upper and lower bounds for a price channel that contain all but the most extreme historical outliers. The downward trend line I annotated comes down from the 2007, pre-financial crisis high and shows that the stock market really began a longer-term breakout in 2012. Long-time readers of the True Vine Letter may recall me once sharing that in October 2012 I was praying and the Holy Spirit showed me a bear tied to a tree that was shot with an arrow. My interpretation of this was that the bear market was dead and a new bull market was underway. The innermost upper and lower bound trend lines that I annotated form the logarithmic monthly price channel for the bull market over the last 6 years. The lower bound stretches from October 2012 through the early 2016 low right through until today. Remember though that this is a monthly price chart so the most recent monthly price will keep calculating which means that this line could ultimately end up above the lower bound trend line. You can see here that in late 2012, early 2016, and now the weekly chart dipped below the lower monthly bound trend line. Given that the near-term fundamental economic backdrop for the stock market remains fine and oil prices also just collapsed, it is likely that we are close to a bottom here in the US stock market. However, the recent 15.5% decline from the September peak was swift and no doubt wounded market participants psychologically. It will probably take at least a few weeks for the market to heal itself which means that if it turns higher in the near-term, it will likely fall back again close to where we are now (a retest of support) before finally beginning another move higher. 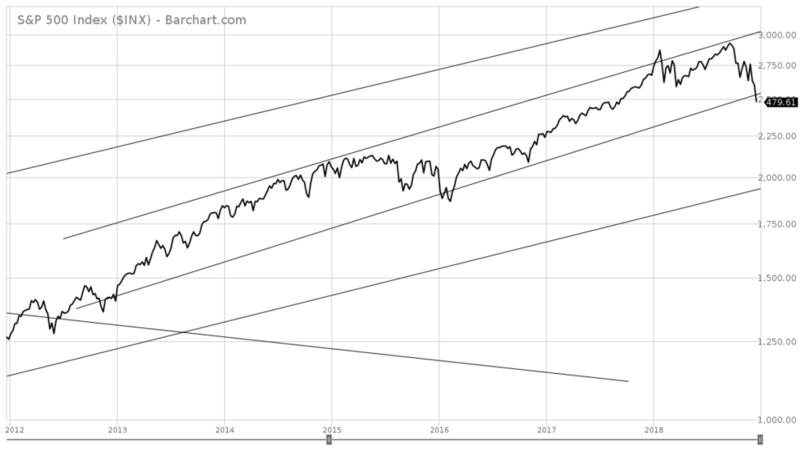 It is my view that the broad stock market is going to make another move higher which will probably take us to the outer upper bound trend line which you can see from the first chart above is roughly around the 3,400 to 3,500 level. If my outlook is right, investors buying at current levels could realize some excellent gains over the next couple of years. One thing I like about doing detailed analysis on a wide array of individual companies from different sectors and countries is that it gives me unique micro views into the global markets from various angles. Sometimes when I hear economic commentators discussing areas of the markets from a strictly macro viewpoint I can see where certain aspects of their views are wrong simply because they lack bottom-up insight. Tetra Tech is a company that I follow. In my proprietary evaluation model, I had them set to the most bullish setting earlier this year which in plain terms means I am willing to pay a higher price for the stock because I think the outlook is strong. At one point I considered the stock to be fairly valued in the $60 to $70 range, however, one could have made the argument that the stock was slightly overvalued there. At the time the stock was around $70 I became concerned about the somewhat extreme overvaluation of small company stocks more broadly and that a sell-off in them would drag TTEK down with them. For that and some other reasons, I decided to sell the stock in client portfolios. As you can see in the chart, my concern was exactly what happened. After downgrading the company to moderately bullish in my model I have them as fairly valued right now. So here you have a stock that went from being fairly valued around $70 to being fairly valued around $53 in my evaluation model simply from an adjustment in outlook. Not a“run for the hills” adjustment, I am talking just one notch. Notably, just like the S&P 500 chart, the stock looks ready to bottom here as it did in January 2016, August 2017, and February 2018 when the weekly price dipped below the lower monthly bound. Notice I said that I think it is fairly valued now around $53 given my moderately bullish outlook for the company. This means it may take some time before the company can begin to move meaningfully higher again. Future earnings projections will need to rise to make it more attractive and the standard way this happens is through (1) the company’s standard quarterly results announcements, (2) positive shifts in the broader economic outlook, and (3) a positive shift in investor sentiment as more people realize that the sky is not falling. Overvaluation of certain sectors(e.g.,small caps and technology) which resulted in a lack of new buyers. Downward adjustment in future economic expectations which resulted in slightly lower earnings expectations for some stocks and the subsequent bringing down a notch of the prices buyers are willing to pay for them(likein my TTEK example). Negative investor sentiment feeding on itself as fears manifested themselves in falling prices which led to more selling. One could include concerns such as trade conflict and new regulation for technology companies in this category. Thanks for reading the True Vine Letter. Please feel free to comment below to ask questions or discuss this topic further. I wish everyone a very Merry Christmas because Jesus Christ came and died for all to restore them to God.